Friends! 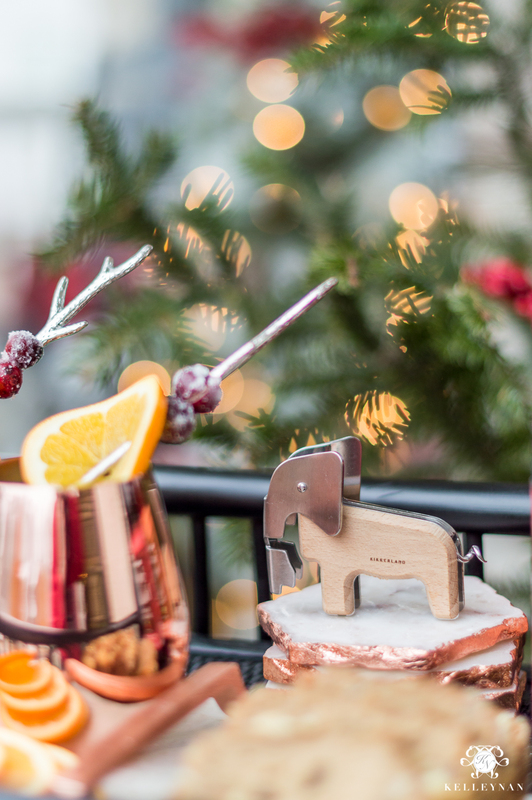 Are you feeling the Christmas spirit yet? 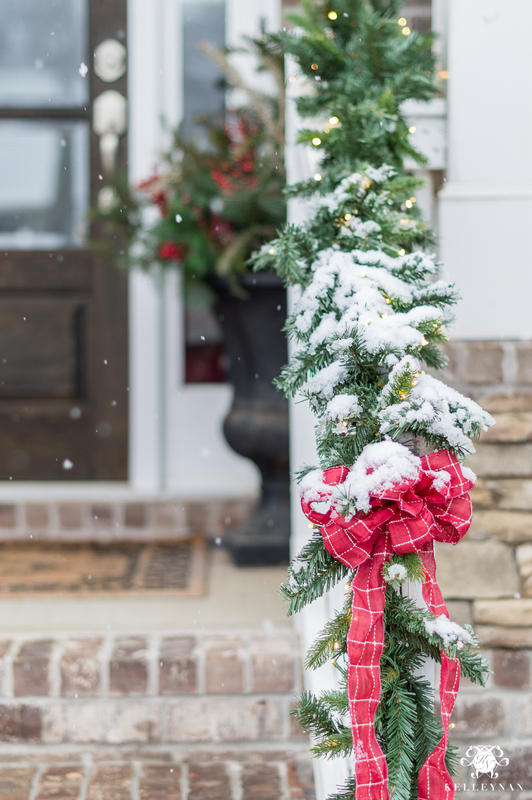 I’m hoping today’s Decked + Styled Christmas Tour, a blog hop filled with holiday inspiration from some of my favs, will help start your week with a little bit of “happy”. 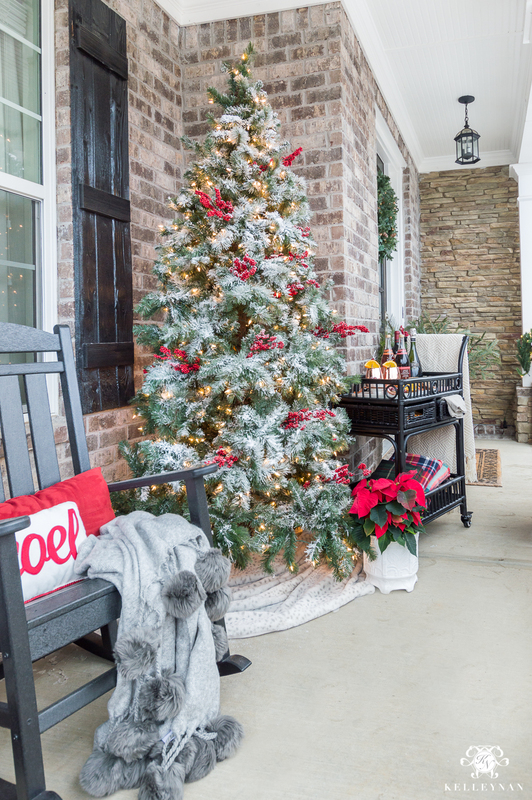 If you’re a regular reader, you already caught the inside of my home in my Christmas Home Tour I shared earlier this season. So, today, I’m going to be sharing what’s happening outside our house. If you are new here, linking over from my friend Megan of Honey We’re Home, I’m so glad to have you visiting with me! I adore Megan and assuming you do too (how could you not?! 😉 ), we’ll get along great. If you want to check in more often, I’d love for you to subscribe to my emails at the bottom of the post so we can stay in touch. If you don’t know Megan, you’ll have to pay her a visit today, along with everyone else on today’s tour. 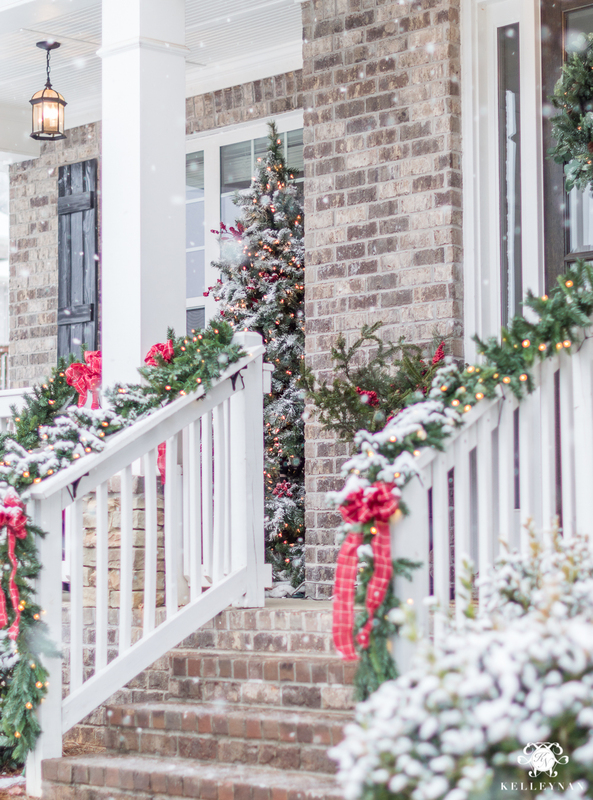 I’ve included all eight at the bottom of the post so you can be sure to check out each after you wrap up my classic Christmas decor for a traditional front porch. Y’all. Something crazy happened this past weekend. You probably already know but unless you live around here, I don’t know that you’ll fully appreciate the magnitude that was our record breaking pre-Christmas snow! 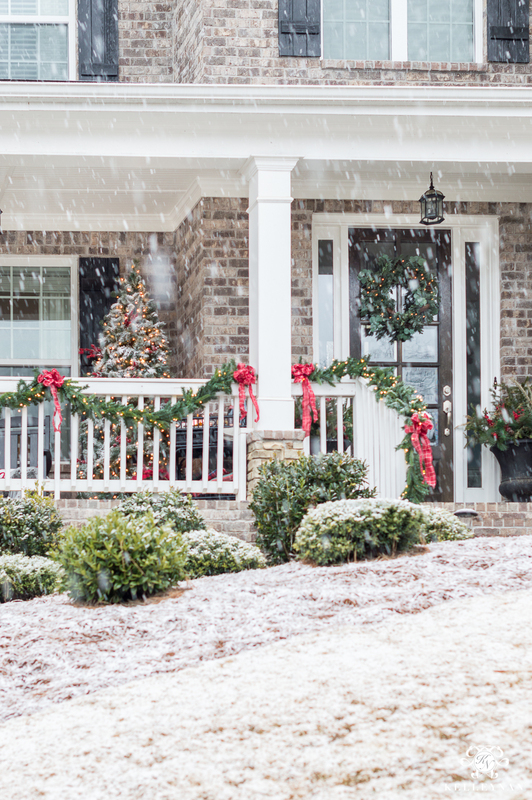 In Georgia, we may get one snow per year; it’s usually icy, melts quickly, and most definitely happens long after the twinkling Christmas lights have been put away. 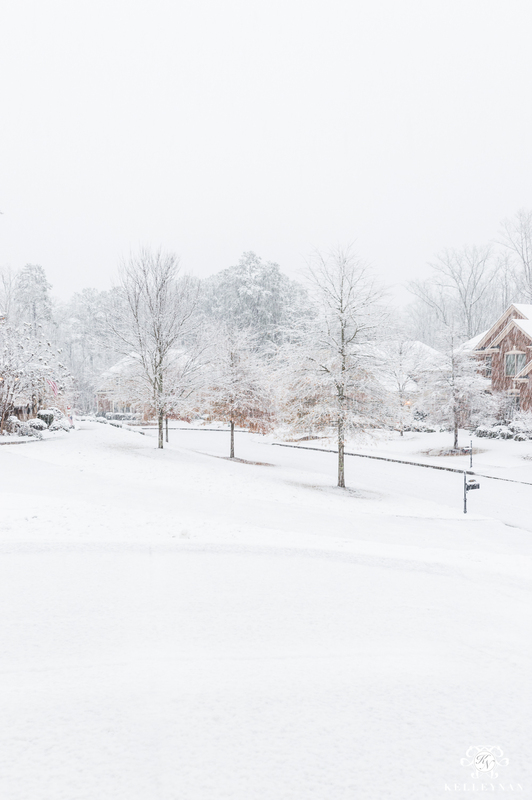 If you saw some southerners celebrating like they’d never seen the white powdery stuff (ahem… me! ), it was for good reason haha. 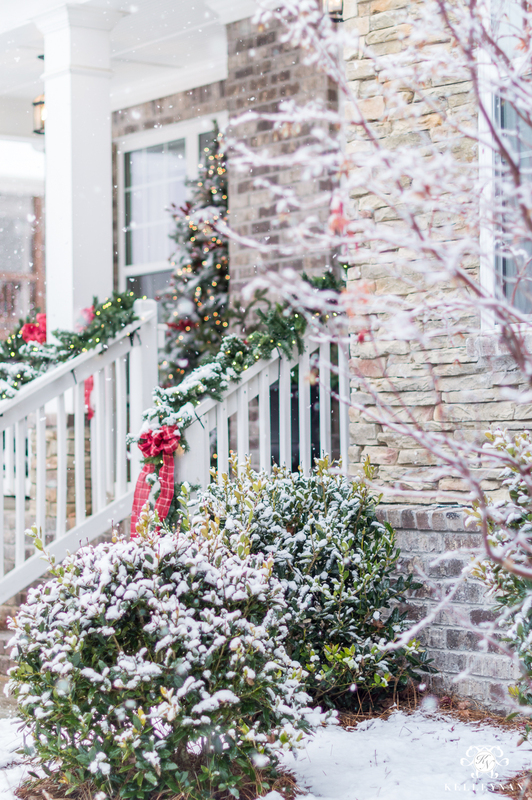 But the best part- I was scheduling to shoot my Christmas porch photos this weekend and as luck would have it, was able to capture it soon after the snowfall began. I can’t recall a time in my life where I was able to see Christmas lights and snow simultaneously so, this truly was a treat. For time reference, most of these photos were taken early in the day, before 10:00 a.m. Where I live, our accumulation was around 9″ before all was said and done. A full source list is included at the bottom of this post. I actually tried to make it down the hill to take another full house once the snow had accumulated but after taking one step out of my garage and almost busting it, I decided that view would best live on in my memories haha. 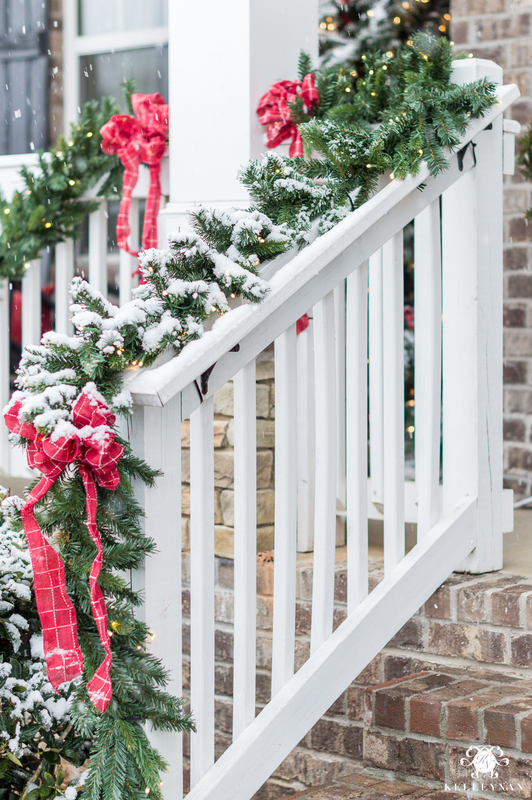 Living in North Georgia, we’ve always kept our outside Christmas decor very classic on our traditional craftsman-style home. 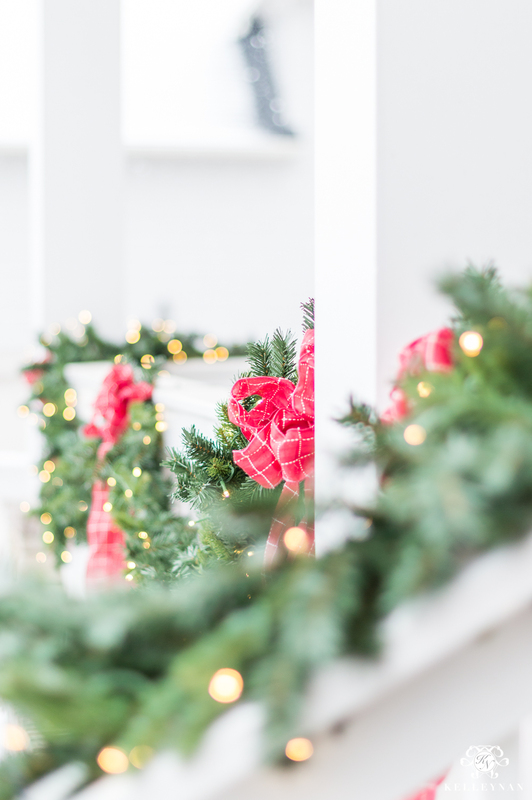 It’s all about the greenery, simple white lights, and red accents. I love that our neighborhood is big on outdoor decorating; it makes me appreciate them all so much for taking the time to create displays for others to enjoy! With the weird weather this year, our holly bushes also have not yet sprouted their red berries. 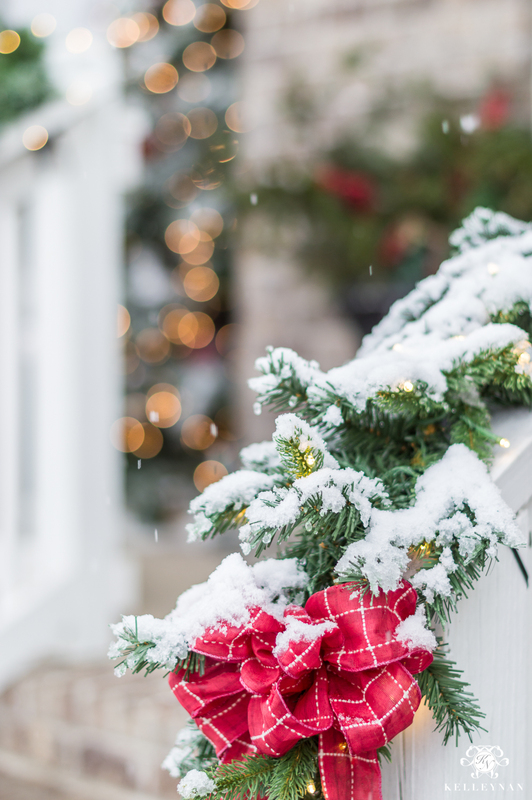 But, I am more than “ok” with it because this year we got a big ‘ol blanket of snow- and that has been the more beautiful outside decoration of all. 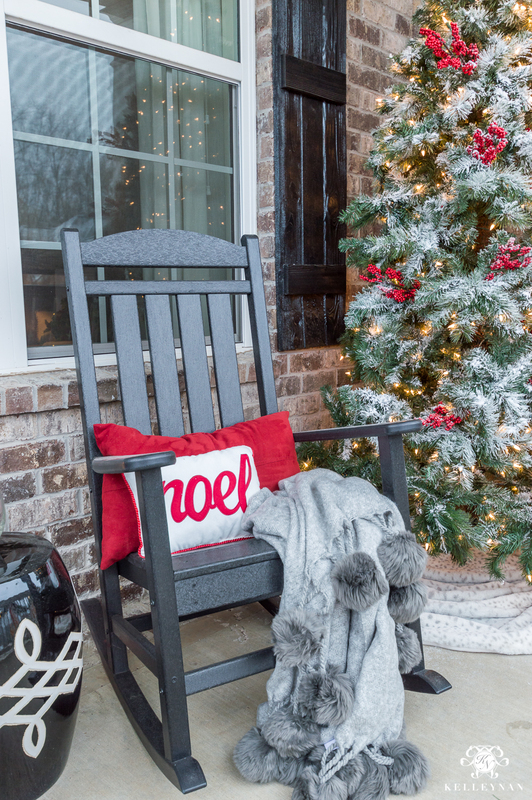 One of my favorite statements we add to the porch is our DIY flocked Christmas tree. It was an older tree from our previous home and instead of getting rid of it, I tried my hand at covering it with snow a couple years ago. I gave it a quick 10-minute touch-up again this year and still LOVE the result. I have the full, easy tutorial HERE on how to flock and the best flock to use. If not this year, you can bookmark for next year 😉 I also did a huge wreath during my flocking session, which also worked beautifully. In our urns flanking the front door, I use a combination of live and faux. 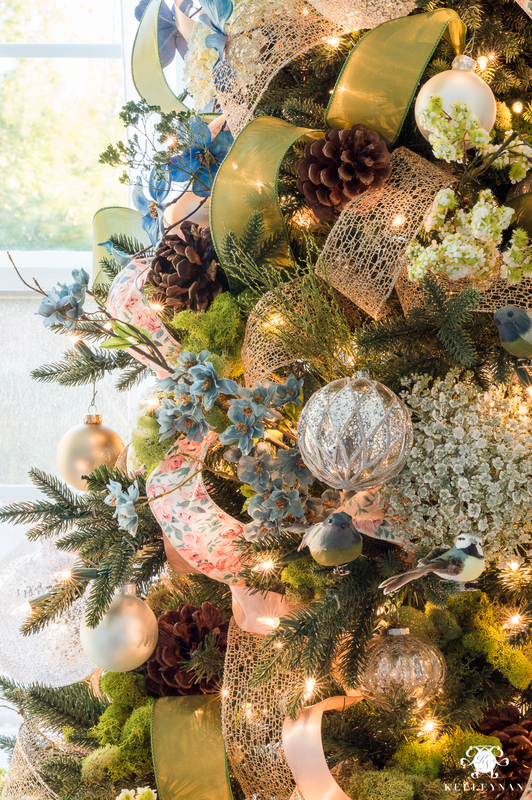 I shared in my Christmas Home Tour that I always head to Lowe’s to take advantage of their huge bin of tree clippings. They are free for the taking and usually last throughout the entire season. 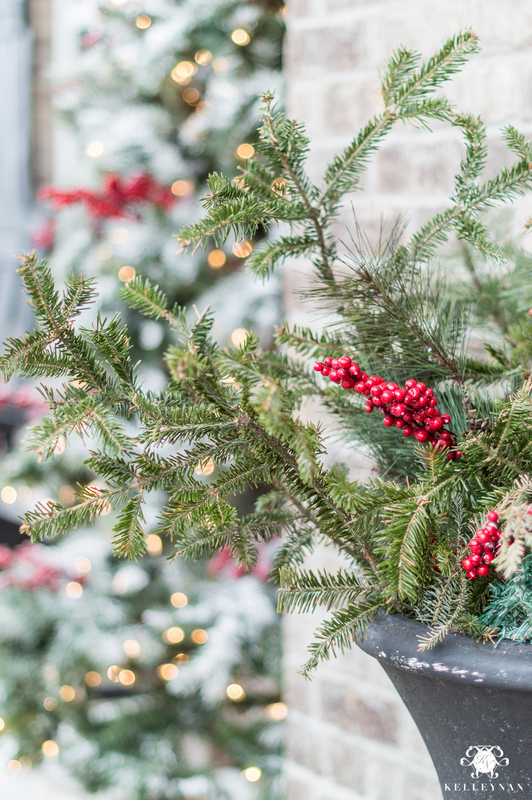 I mix the real fir some some faux pine and red berries as a little filler, and stuff them until they are looking just a tad crazy and over the top 😉 We also keep bricks stacked inside the urns which helps to support all the limbs. For reference, these clippings are over 3 weeks old, unwatered, and are still green. 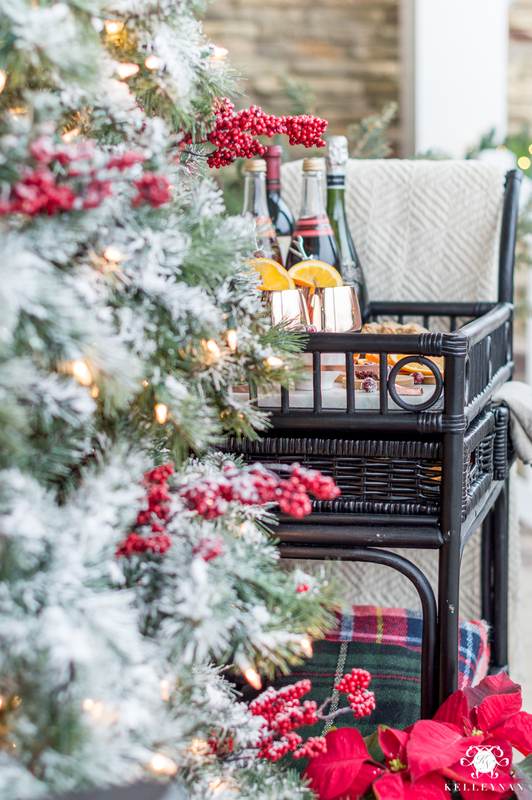 If we’ve been friends for a while, you already know my love affair with bar carts and THIS ONE was the perfect investment this past summer, especially for outdoor entertaining. It’s out of stock but World Market, you totally need to bring this back! 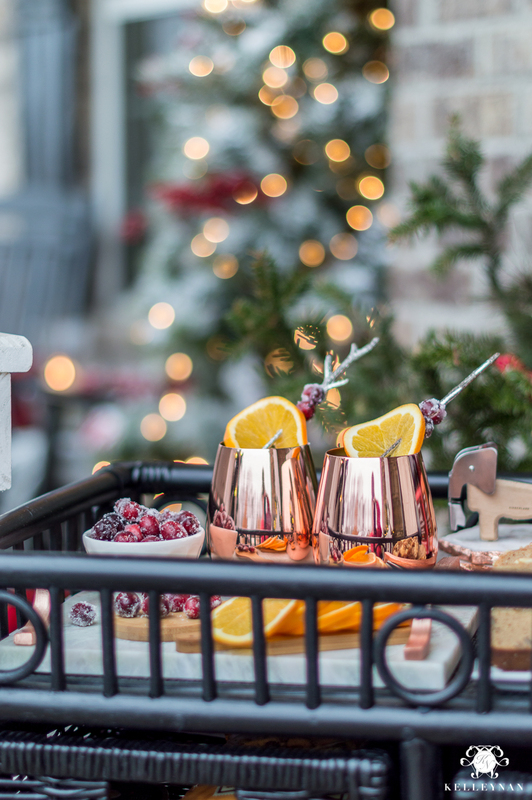 When I was growing up, I lived for (what we called) “special drinks” throughout the holiday season. They were basically different versions of Shirley Temples but you could give me anything – if it had a fruit garnish – call it a “special drink”, and I would be in Heaven. 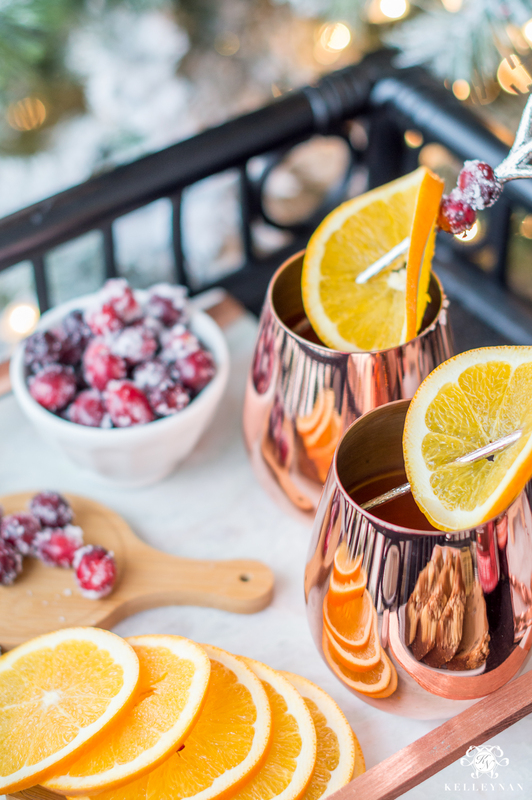 We always dedicated certain evenings to whipping up some “special drinks” in our classic holly-bordered stemmed glasses, gathering around the Christmas tree, turning on our favorite classics, and sharing what we were thankful for that year. Sometimes, I wish I could re-visit those days when all it took to make me excited was for Mama Nan to pour a dash of maraschino cherry juice in my ginger ale. These tiny little wooden paddle boards (HERE) are a new addition and y’all- they are about the size of my fist. SO dang cute! 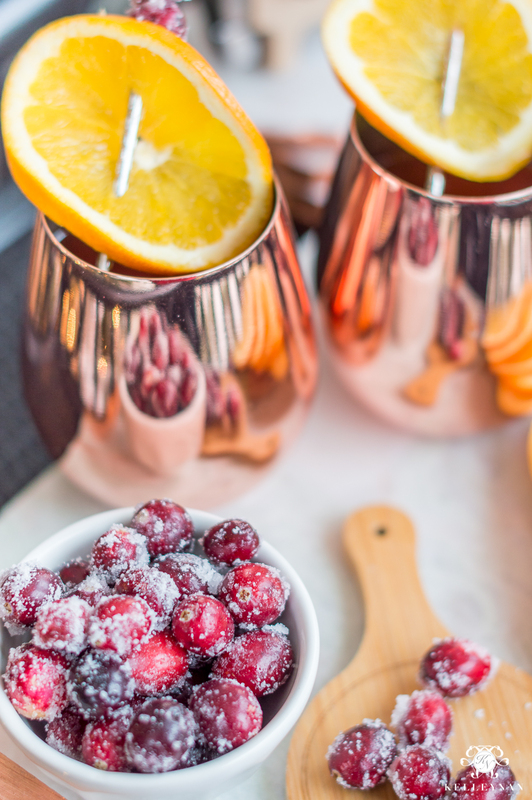 they come in a set of six in three different shapes and are perfect for tapas, snacks, or to even run down a table as an edible centerpiece. 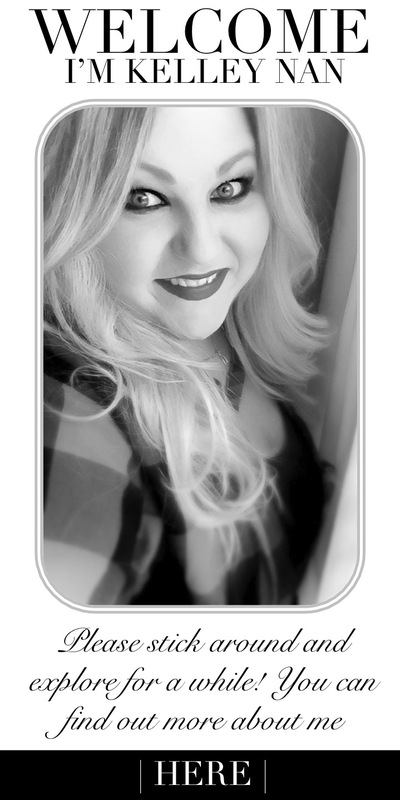 (They are also only $18 for the set, plus free shipping ;)). 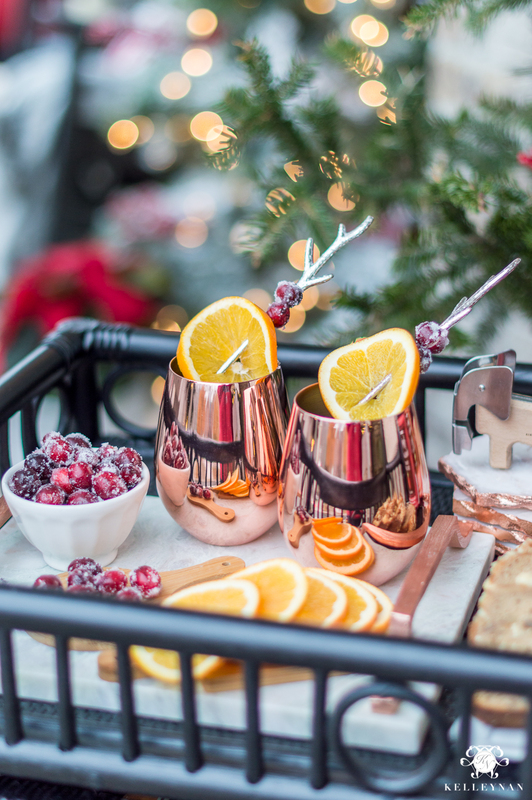 The stemless copper wine glasses (HERE) are also a new addition and I think I need to buy another pair before the holiday season ends. I was actually shocked at how beautifully they wash up. 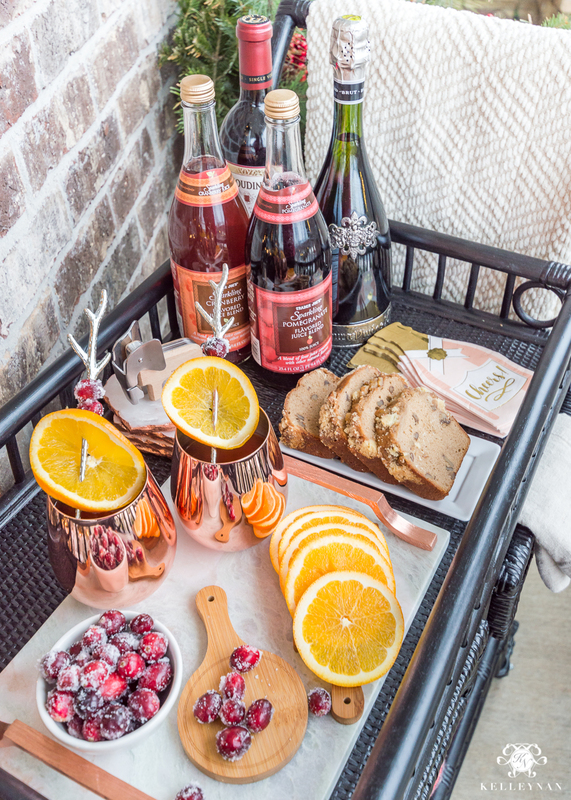 They coordinate with my new marble and copper handled tray (HERE) and copper-edged marble coasters (HERE). 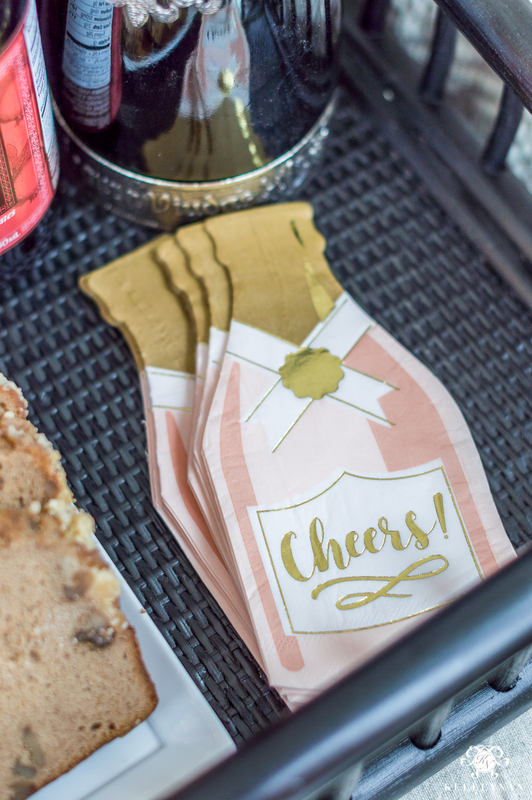 These new beverage napkins can basically be used for any occasion – how cute would they be for a bridal shower?? I recently found them at Express (they are now out of stock) but I did find them on Amazon (HERE). I love THESE too that they do still have in stock. 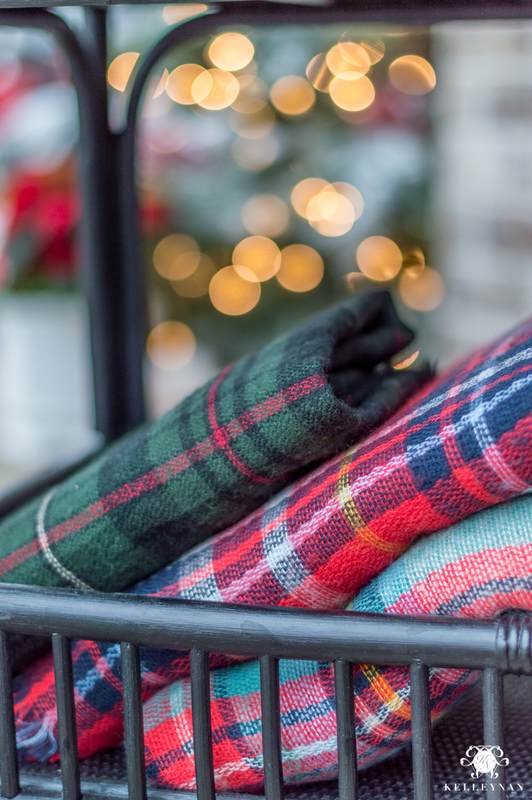 My blanket scarves serve double duty this time of year. 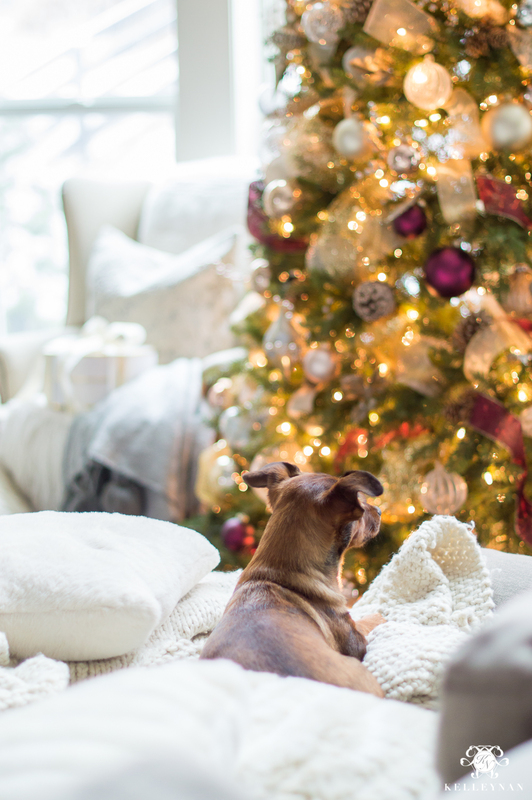 Bring those babies out of the closet and cozy up your baskets, favorite sitting spots, and the backs of chairs by using them as festive throws. 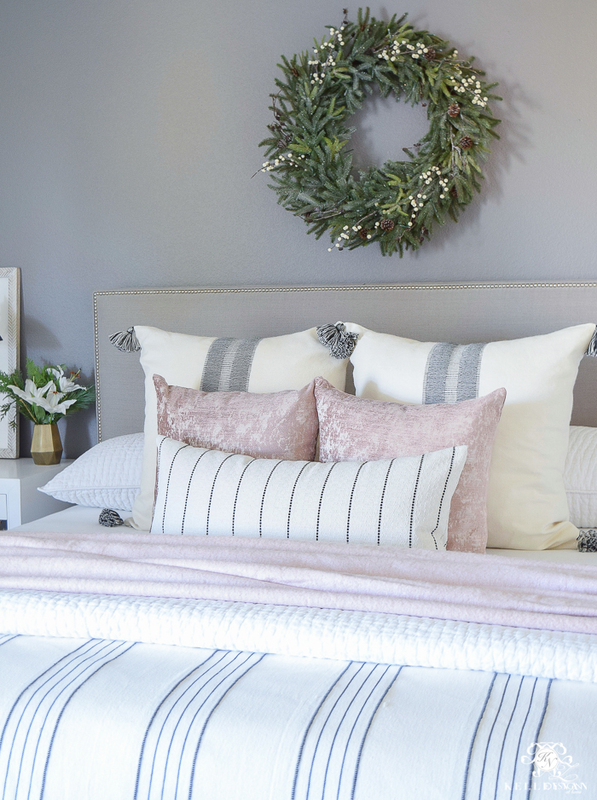 Speaking of “throws” this gray one with pom poms (HERE) has been making its way all over my house. It keeps selling out and coming back in stock momentarily, but it never stays long. If it is sold out, THIS ONE is super similar and available in several colors. While I was outside snapping pics, Maggie was inside, mesmerized, watching all the white stuff falling from the sky. It’s a close call but out of all three “kids”, I would say Maggie was the most addicted to begging to go outside to play in the snow. And by late afternoon, here’s where we were. If you saw my Insta-stories, (follow me on Instagram HERE), you saw what things were looking like the next morning 😉 I don’t remember seeing my porch in the snow before but now that I have, I think this is definitely her best look! Maybe we’ll even get one more snow surprise this season, but I won’t push my luck. 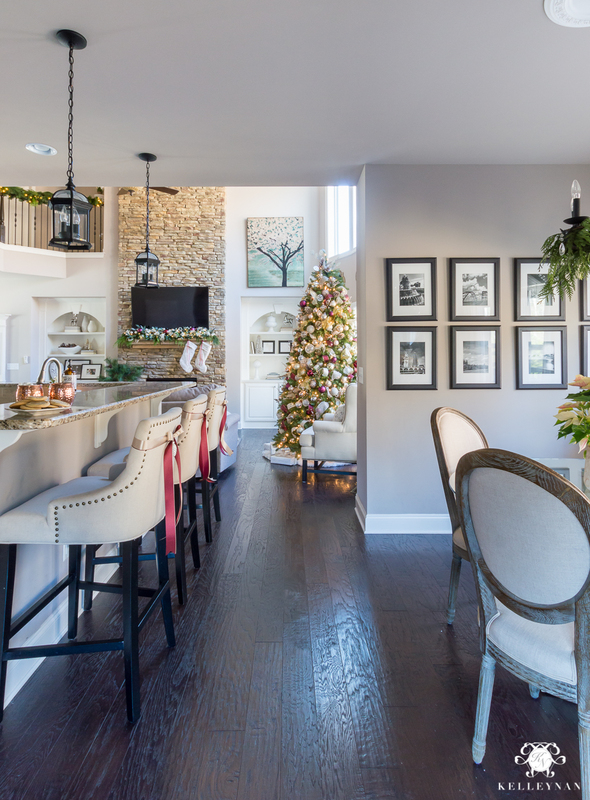 Head over to see her holiday dining room and bedroom HERE. After you visit with Bree, you won’t want to miss anyone on today’s hop! Here’s the full lineup to make sure you stop by each home. It’s been a heartbreaking year for so many; sending my love to all of you and hoping we can love on each other just a little harder this Christmas. 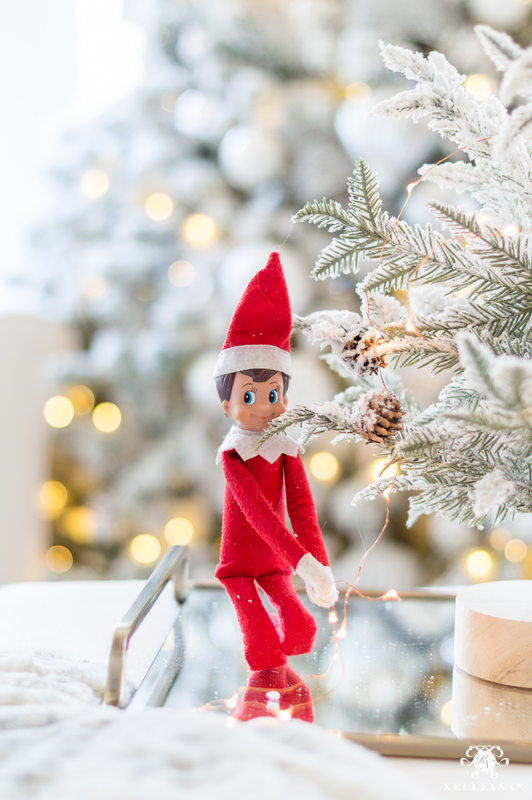 HAVE YOU SEEN THESE CHRISTMAS FAVORITES? 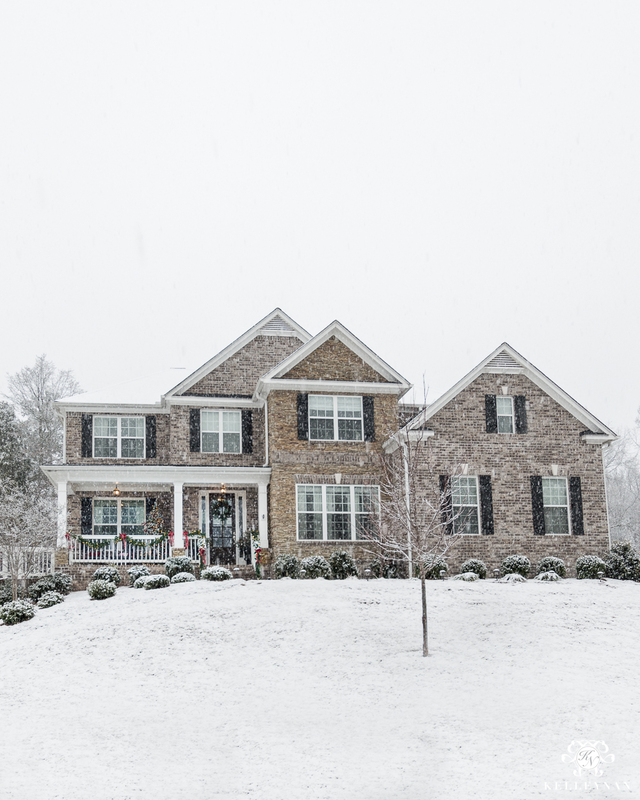 We’re in Alpharetta and enjoyed the beautiful snow too! Not too much, not too little, it was just right! Happy Holidays! How amazing to have snow for those gorgeous pictures you took. I Love all your cute bar essentials. That is one thing I lack (good bar stuff) and need to get some at the after Christmas sales. My son still likes a good Shirley Temple when we go out to dinner sometimes. I used to do a tree on our back porch a couple of years ago and your gorgeous porch tree inspired me to do one again next year. Wish me luck. 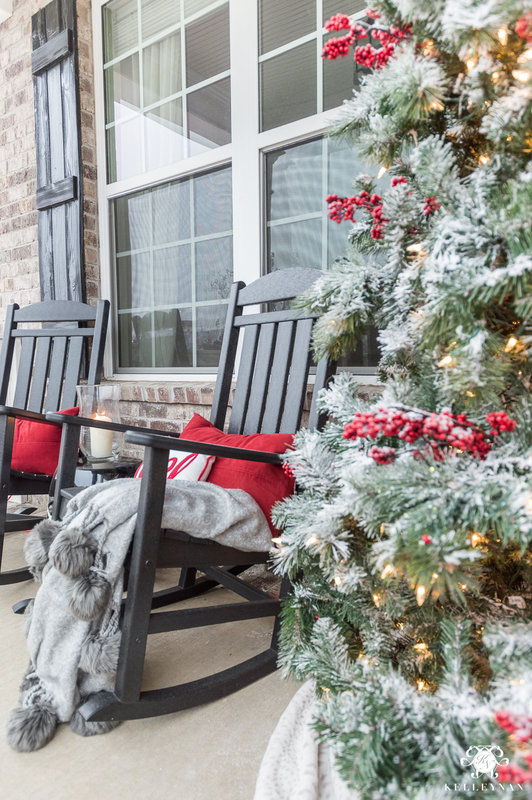 Your front porch is so festive and welcoming! 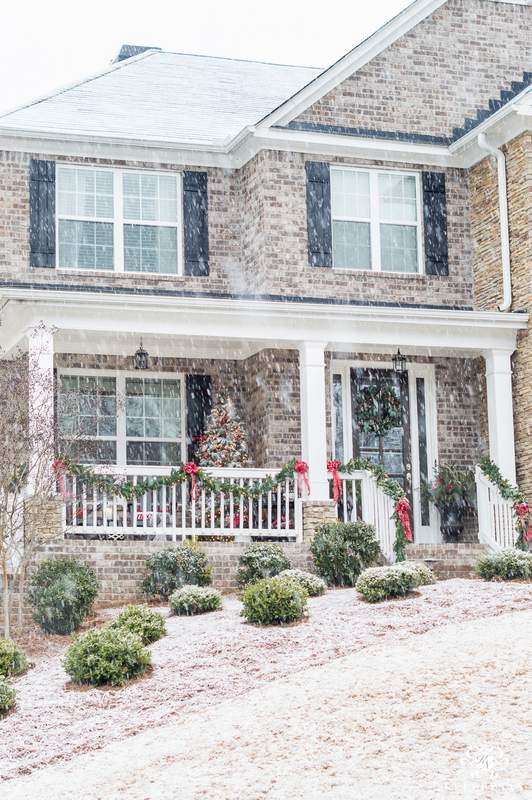 You are right…just look what that special snow added. This will certainly be a year to remember. Love the homage to our special toasts. Cheers! Wow, this post is beautiful. 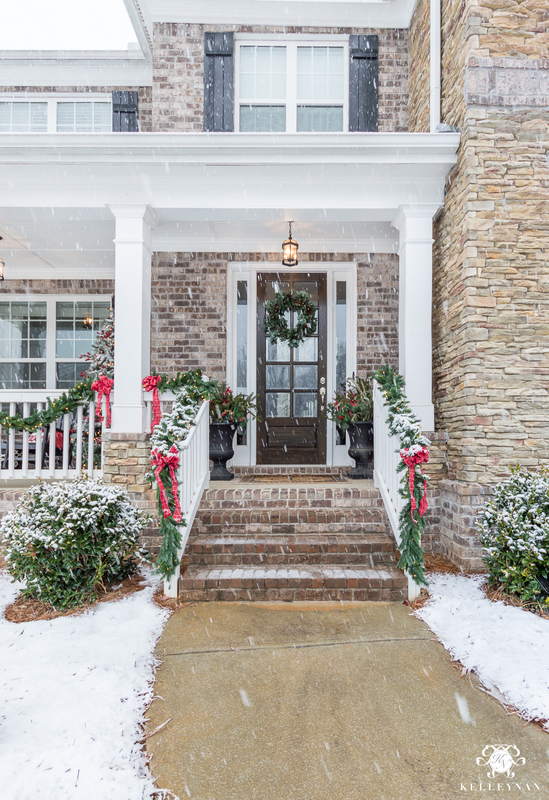 I love the photos, even with all that lovely snow I want to snuggle up on the front porch!! Just discovered your blog and Oh My Goodness ………you have exquisite taste and your home is beautiful. As a fellow southern, you epitomize ‘southern hospitality’. Thanks for a beautiful blog! 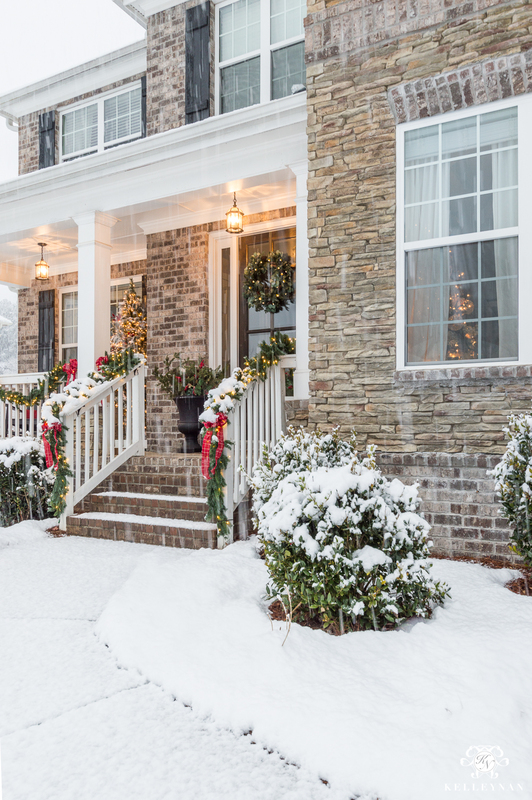 What a festive winter wonderland! 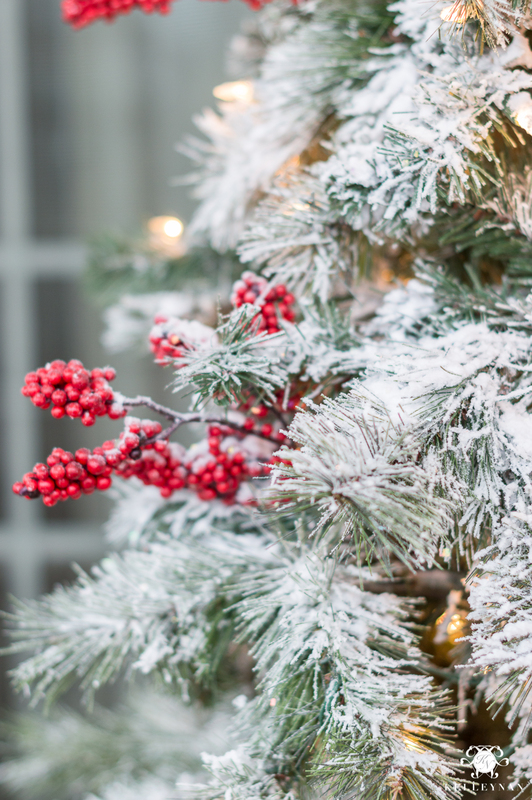 I love that you put a tree on your front porch! It’s so beautiful, along with your other Xmas trees. I was thinking of doing something similar on top of our garage (ours is out front) but I also run out of “time” after decorating the house. I have all these ideas and can’t wait until I can actually implement them!